With crinkled noses and uncharacteristic focus, my two young daughters slowly and silently stir the contents of small bowls clasped in their hands. It’s not cake mixture, nor is it a bright gloopy paint (both favorites) that mesmerizes them. Instead, the bowls contain something more unusual: a heady fusion of aromatic raw ingredients that form the basis of Japanese incense. Japan is famed as a nation steeped in rich traditional culture, from its ikebana flower arranging and the tea ceremony to shodō calligraphy and haiku poetry. And firmly included on this list is Japanese incense making. An art form as old as it is revered, incense is believed to date back as early as the sixth century, arriving hand in hand with Buddhism and its associated rituals and ceremonies. Fast forward more than 1,000 years and one place where all things incense-related are still going strong is Kyoto. 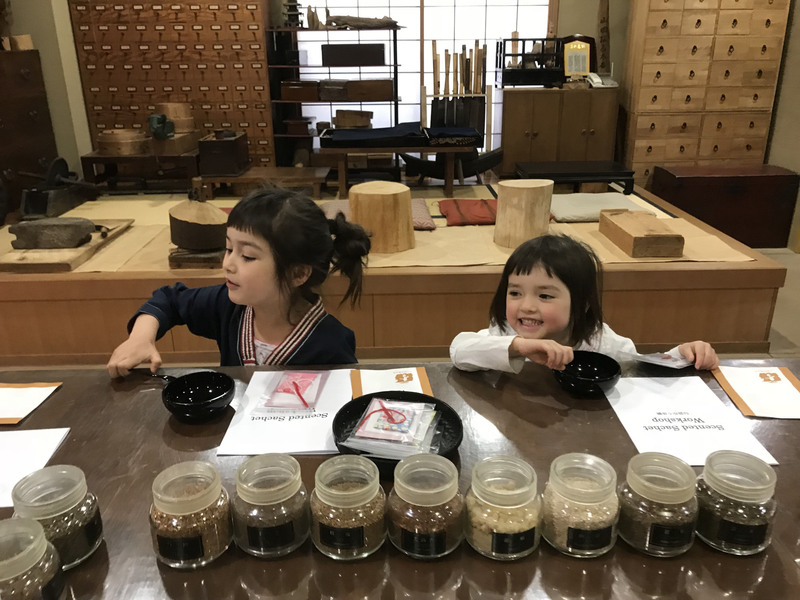 Perhaps unsurprisingly, the ancient capital is home to a number of generations-old incense makers where kōdō (the art of Japanese incense) is celebrated in all its glory. Among them is Yamada-Matsu. 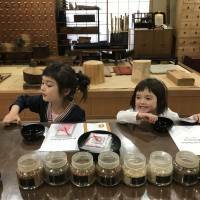 A short walk from the Kyoto Imperial Palace, the family-run business has been operating for around 250 years and has long been famed for its high-quality Japanese incense. Yamada-Matsu not only offers an array of products for sale in its Kyoto flagship store, it also holds workshops offering firsthand experience of how to make it. While some of the classes are strictly for grown-ups (its meditative incense appreciation classes and the sessions that involve burning in particular), the company offers one activity for small incense lovers: a scented sachet workshop. Our workshop takes place at a wide wooden table, lined with an extensive collection of large apothecary-style glass jars filled with a museum-like assortment of incense components. It starts on a high note when the girls are asked to choose their favorite colors from a selection of pretty traditional Japanese fabrics in rainbow-bright hues and patterns that would not look out of place on a kimono. Next, our teacher Itsuka Hattori, earnestly dressed in a black suit and white shirt, talks us through the wizard-like collection of dozens of ingredients lined up before us. As the company’s recipes are shrouded in secrecy, I can only reveal here that they include an assortment of exotic resins, woods and dried plant roots (among them, sandalwood, clove and star anise) from a number of Asian countries. And then, the fun begins. The teacher instructs my daughters to place a very specific number of spoonfuls of each of the eight ingredients before them into their bowls, in order to create the base incense. The girls giggle as they sniff the various materials — at times screwing up their faces due to the overpowering potency, other times declaring it sweet, stinky or spicy — before taking great pleasure in counting out spoonfuls into their bowls. Once done, they’re allowed to top up the mixture with some of their favorite of the eight scents, resulting in more sniffing and giggling before they sit and studiously mix the contents of their bowls. Finally, it’s time to fill the pretty silk sachets they chose earlier with their newly created incense. The teacher assists as they tip the concoctions into the fabric pouches, before they are neatly tied with strands of colored thread. Sachets completed, the class continues with the creation of some small paper incense sachets. 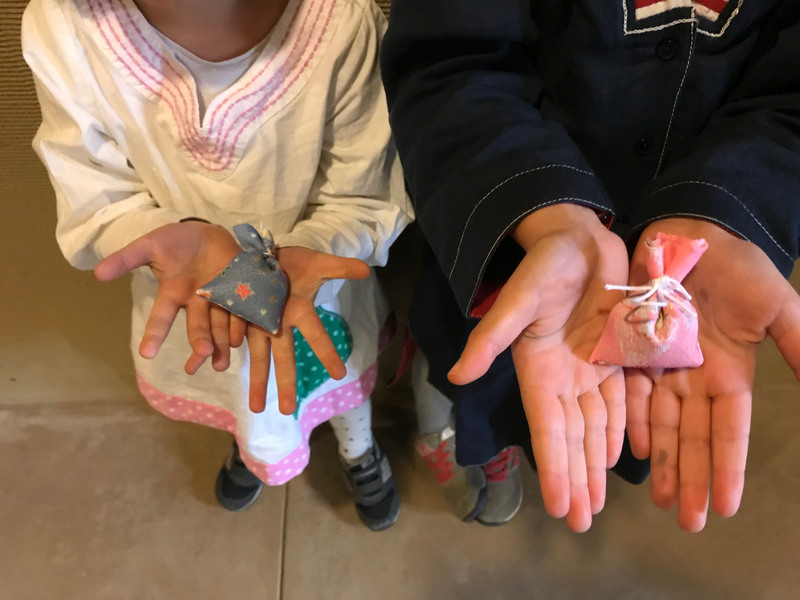 Using some origami-esque folding (another favorite activity of my girls), the girls construct little envelopes for their leftover incense blends. 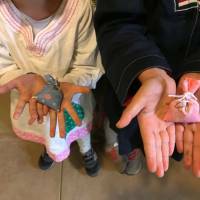 Again, they are unusually silent as they bend over their pieces of paper and — with the help again of the teacher, plus a useful guide with illustrations — delicately wrap up their incense mix. As the girls finish their lesson, happy with their array of aromatic sachets, Yuka Kawahara, the company spokeswoman, tells me a little about the incense workshops. Yamada-Matsu holds regular workshops at its Kyoto store at 164 Kageyukoji-cho, Muromachi-dori, Shimodachiuri-agaru, Kamigyo-ku, Kyoto; 075 441 1123. Scented sachet workshops take place at 3.30 p.m. Mon. to Fri. and reservations are required one working day in advance. The workshop lasts around 50 minutes and costs ¥2,000. Private workshops can be arranged on request. The company also runs workshops from its Tokyo store in Hanzomon. For more information, visit www.yamadamatsu.co.jp/en.